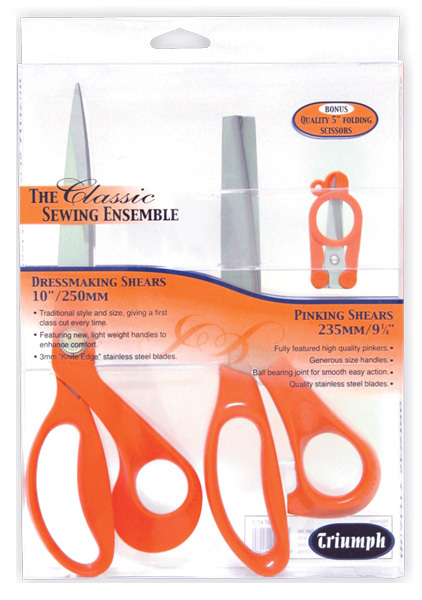 The Classic Sewing Ensemble features 10″ Dressmaking Shears, 9¼” Pinking Shears and BONUS 5″ Folding Scissors. The Dressmaking Shears feature ball jointed, contoured easy grip handles and are hand assembled to ensure great quality. The quality Pinking Shears feature stainless steel blades that resist rust and corrosion with superb cutting power guaranteed, and ergonomically designed handles that are both comfortable and functional. time. Featuring lightweight handles to enhance comfort. Quality materials such as unbreakable ABS handles with quality stainless steel blades that resist rust and corrosion. 3.0mm ‘Knife Edge’ double ground hardened steel blades. Ergonomically designed handles that are both comfortable and functional. Full four finger handles for extra comfort and power. 3mm ultra sharp double ground serrated stainless steel blades. Perfect for all fabrics, also office, craft and for all general household use! These scissors are designed to suit the hand perfectly, giving extra comfort and cutting power, combined with quality stainless steel serrated blades.